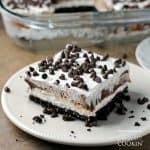 Chocolate lasagna is a no baked layered dessert made with cookies, cream cheese, whipped cream and chocolate pudding. It's a chocolate dessert dream! Use a food processor (or a zip top bag and a rolling pin) to crush the Oreos into fine crumbs. Into a medium bowl, pour in the cookie crumbs and melted butter. Stir until thoroughly mixed. Pour into a 9 x 13 baking dish and use a spatula (or the bottom of a measuring cup) to evenly press the crumbs across the dish. In the same medium bowl, add the cream cheese and beat with a hand mixer until fluffy. Add in the 2 Tablespoons of milk and sugar and mix well. Fold the contents of one of the 8 oz Cool Whip containers into the cream cheese mixture. Spread the cream cheese mixture over the cookie crust and pop it into the fridge to set for about 10 minutes. While it's setting, to a large bowl, add the pudding mixes and 2 3/4 cups milk and beat on medium until it starts to thicken. Spread the pudding mixture over the cream cheese layer. Put back into the fridge to set for another 10 minutes. Once set, gently spread the remaining 8 oz of Cool Whip over the top and sprinkle with mini chocolate chips. Cover with plastic wrap and let chill for at least 4 hours in the fridge or 1 hour in the freezer before you slice. Do not remove the cream centers from the cookies. Use regular Oreos, not Double Stuff. Use 2 boxes of instant pudding, do not use Cook n Serve. 36 cookies = 3 cups of crumbs. You can make this dessert up to 3 days ahead, keep refrigerated. This recipe for Chocolate Lasagna was printed from AmandasCookin.com - https://amandascookin.com/chocolate-lasagna/ and can only be printed for education or personal use.